USA Based company, firmly known as Brute coolers of Brute Outdoors boasts of its American Craftsmanship. With the diverse variety of huge product line up, the Bison promises to win the hearts of people. Coolers, Drinkware, Gears, and Accessories are offered by Bison to get you super crazy. One can choose coolers from the variety of options keeping their favorite colors in mind. Let’s be familiar with the product line up of Bison. Bison majorly deals in Bison Hard Coolers and some soft-sided coolers. You can choose the coolers depending upon your requirements, storage, colors, and many other factors. Let’s get to know what Bison has to offer across Bison Hard Coolers and Bison Soft Coolers. Under the category of Bison Hard Coolers, the Bison has to offer only 4 hard coolers. This eventually makes the consumers have a limited choice. Consumers can find 25 quarts, 50 quarts, 75 quarts, 125 quart Bison Cooler under the Bison Hard Coolers. You can choose the Bison Ice Chest depending upon your storage requirements. Along with Bison Hard Coolers, Bison also deals in Bison Soft Coolers. For the time being, Bison has only two options to offer. Bison Soft Cooler offers the capacity of 12 and 24 can which is roughly 18 and 32 when converted into the liters. Further, under this category, there is not much to get from the Bison. Although Bison Ice Chest lack in some top-notch features as offered by other premium brands but few of its features are quite interesting. So, let’s break down the features of Bison Ice Chest. Rotomolded Constructions: The most noticeable feature of Bison Coolers is the Rotomold Walls. The science behind the rotomolded construction is that the walls of the Bison Ice Chest are too strong to fall. The durability, strength, and strongness are worth noticing. Bison ice chest won’t fall apart if it meets with an accident staying as a one piece. Two Inch Insulated Walls: Besides the rotomolded construction, one thing to look at is the two inch insulated walls. The two inches insulated walls keep your food and beverages cold that refresh you during the hot summer. Laced with shark fin gasket technology, the walls keep the cold air inside the Bison Ice Chest and let’s not escape air into the environment which eventually helps in keeping ice as ice for an extended period. Rubber Latch System: Rubber Latch System replaces the conventional T latch technology and that really helps in the closing of the cooler thus not letting the cold air escape into the surroundings. Eventually, it helps in increasing the insulation period and ice retention period. We know that Bison deals in Hard Sided Coolers and the Bison Ice chest comes in different storage sizes and colors. So, let’s check out the comparison among the Bison Hard-Sided Coolers to get more insight about the ice chests. The Bison Hard Sided Coolers offers similar Specifications and features. The major differences among these coolers lie in their dimensions, weight or storage capacity. Due to the difference in storage capacity, ice retention also varies. Our table portrays a clear view of the considerable differences among these coolers. Apart from this difference, their offerings in terms of features are almost the same. Mobility: With the rope handles installed inside the Bison Coolers, it becomes easy to carry the Bison Cooler. The rope handles give a great grip to the hands and your hands do not pain while carrying or holding the Bison Cooler The cantilever latches offered by Bison makes it much easier to open the cooler rather than those conventional T latches. The cantilever latches also offer a great grip to the hands. Durability: In terms of durability, strength, and strongness, Bison coolers remains unbeaten and unmatched. Thanks to the rotomolded construction and the rotomolded wall that can stand any adventure when you step out of your home. The build quality is much superior and the design feels so premium when hold. The innovative and exclusive design charms the customers. Ice Life: What’s more interesting to know the ice life of the Bison Cooler. The ice retention capacity of Hard Sided Coolers lives up to our expectations. With more than 7 days in Bison Hard Coolers, the Bison Coolers are sure to keep your beverages cold when you step out of your home on a journey. Under the category of Soft Sided Coolers, Bison offers only two models that vary in storage capacity. You can either choose Bison 12 can– Softpak Cooler Bag or Bison 24 can- Softpak Cooler Bag. 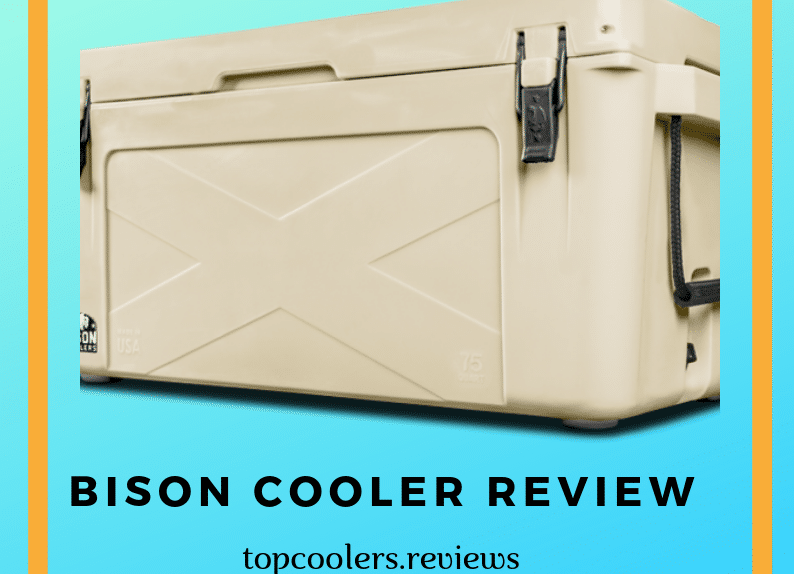 To give a clear view of these coolers, we have drawn a comparison between these two Bison Soft-Sided Coolers that will definitely help you in making your decision. Despite the major differences between these two coolers, they share common features. Let’s proceed to see what these coolers share in common? Strong Build Quality: These coolers have a strong build quality and can resist tear up to 375 pounds. Being UV Resistant, these coolers are not affected by the sun rays which ultimately do not affect the ice retention of Bison Soft Sided Ice Chest. The fact they are made in the USA ensures the quality of the product. Portability: Bison soft-sided coolers are much portable. Their compact design makes them ideal for traveling, hunting, camping. These coolers feature shoulder strap for the easy mobility of the coolers. They can be carried to one to another using the shoulder strap. Moreover, they are much lightweight and they don’t put much stress on your shoulders. High Insulation: Bison Soft Sided Coolers offer great insulation. This is because of the fact that these coolers feature one inch of the insulated wall which helps to retain the ice for the longer duration. In addition to this, these coolers come with the UV Resistant technology. Being UV Resistant, these coolers are not affected by the sun rays even when they are placed under the scorching heat of the sun. Ice Retention life of any cooler must be high to top the industry. What’s the use of coolers if it can retain the ice for a longer duration. Let’s find out how bold and strong Bison Ice Chest are in terms of Ice retention. Usually, a lot of factors play a crucial role in determining the ice retention of coolers. These factors include the weather, how many times the cooler was opened, how much amount of box was put in the coolers and that’s why the result differs from what it is claimed to what we get. Bison Hard Sided Coolers Ice Test: After the test was conducted, it was found that the Bison 25 quart can retain the ice between 40 to 60 hours. While the Bison 50 quart has the capacity to hold the ice between 60 to 85 hours. Wheres Bison 75 quart got us a tad surprised. The ice retaining capacity ranging between 80 hours to 125 hours seems quite impressive. Talking about the Bison 125 quart, the ice retaining capacity live up to our expectations. With more than 125 hours of ice retaining capacity, the Bison 125 quart left us amazed. Bison Soft Sided Coolers Ice Test: Coming to the Bison Soft sided Coolers, we also tested the Soft-sided coolers to see whether their claim of 24 hours ice retention was true or not. After the test, it came to our notice that the ice retention period of Bison 12 can soft pack has the ice retention capacity of 12 hours to 16 hours. Bison 24 can soft pack can hold the ice between 16 hours to 24 hours which is almost close to one day. Conclusion: The hard-sided cooler such as Bison 125 quart can hold the ice for about 7 days which was true as claimed by the Bison itself. The same is true with the Bison soft-sided coolers whose ice retention is identical to what was claimed by the Bison i.e 24 hours. So, what we concluded was that variations in the factors can bring changes in the ice retention of the Bison Coolers no matter what category does the cooler belong to i.e Hard Cooler or Soft Cooler. Bison Ice Chest has brought something simple yet effective Coolers in the industry. With not so much huge variety, Bison coolers manufactured different coolers according to different storage sizes but the thing that seems so impressive is that they had used a standard storage capacity according to the customer’s need. Bison Ice Chest is much better for those who want to go on a short trip and at the same time keeping their budget compact. In such price range, the superior build quality is another addition that must not be taken for granted. Read our more Cooler Reviews that are just a click away. Get in touch with us if anything bothers you. Feel free to reach us out anytime. We are always standing by your side.